S.D. 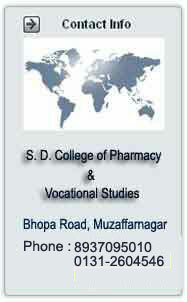 College of Pharmacy & Vocational Studies was established in the year 2001, under the aegis of The S.D. College Association. The Institute offers, full time four-year degree course in Pharmaceutical Sciences. The institute is located in a peaceful & Pollution free environment, which has an attractive building comprising of administrative block, Lecture halls, laboratories, Library, Medicinal garden, Lush green lawns & play grounds. The institute is just 2 Km from main Roadways Bus Stand & 1 Km from Railway Station of Muzaffarnagar. S. D. College of Pharmacy & Vocational Studies is committed to become one of the leading centers of higher education in the region while serving the intellectual, cultural, social, environmental, and economic needs of the students. As a result, Institute will invigorate and strengthen the region and state through its educational programs, research initiatives and outreach efforts. 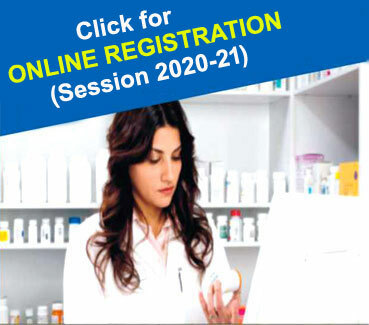 S. D. College of Pharmacy & Vocational Studies is devoted to discover, communicate and apply knowledge in a complex and changing world of Pharmacy. The university identifies, attracts and graduates students of high potential for education. Through a commitment to excel in teaching, research and service, Institute prepares students for lifelong learning and for responsible participation in the global community.